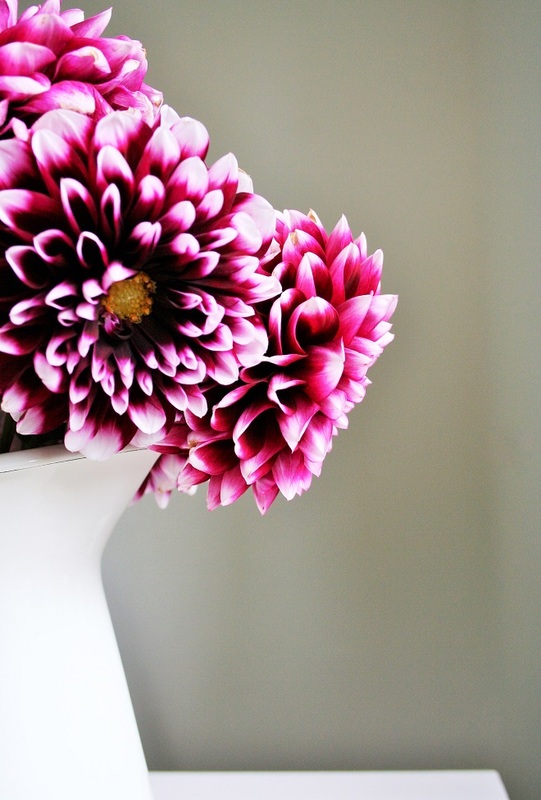 I love flowers and have always enjoyed a bouquet of fresh flowers in the house. Flowers are relatively cheap in the Netherlands and even in winter, there is an abundant choice of flowers and colours. I usually buy my flowers at the market. I love going to the historic city centre each week to buy vegetables and bread. There is so much to see and always something to taste at the market. I enjoy the lively atmosphere in the streets and squares on market days. Every week I spend 5 euros on myself, buying two or three bunches of flowers. I think it’s a solid investment. I put them on the kitchen table in a vase. Lately, I like them in this simple white jug. It’s a small luxury that makes such a difference. Even on dark and rainy days, they light up the kitchen. I smile every time I pass them. 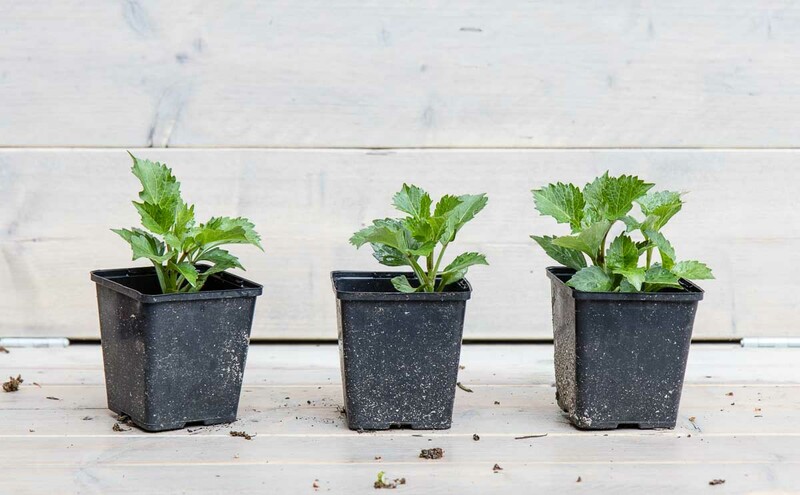 As you may have read on my blog I’m new to growing flowers. 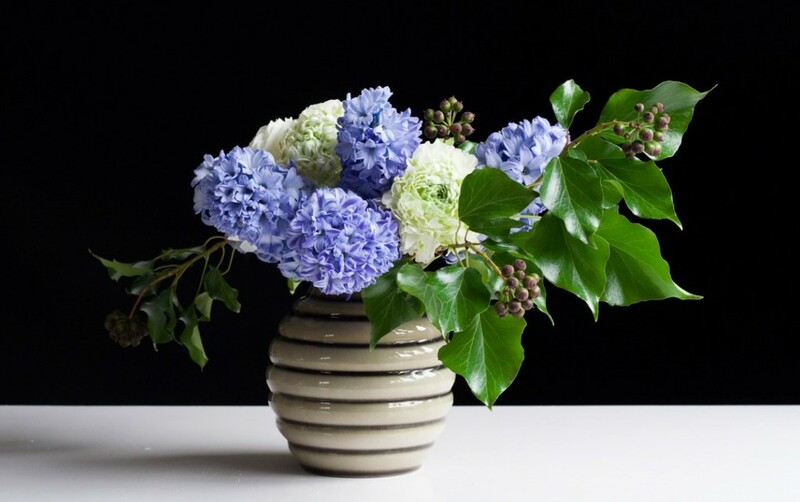 Last year I filled a few vases with flowers from the garden, using rhododendron and hydrangea. And of course, there were the sweet peas. But I didn’t grow lots of flowers and didn’t cut a bouquet regularly. So when I came across this cutting garden last September I couldn’t resist a visit. The cutting garden is part of a chicken farm and located behind the farmhouse. 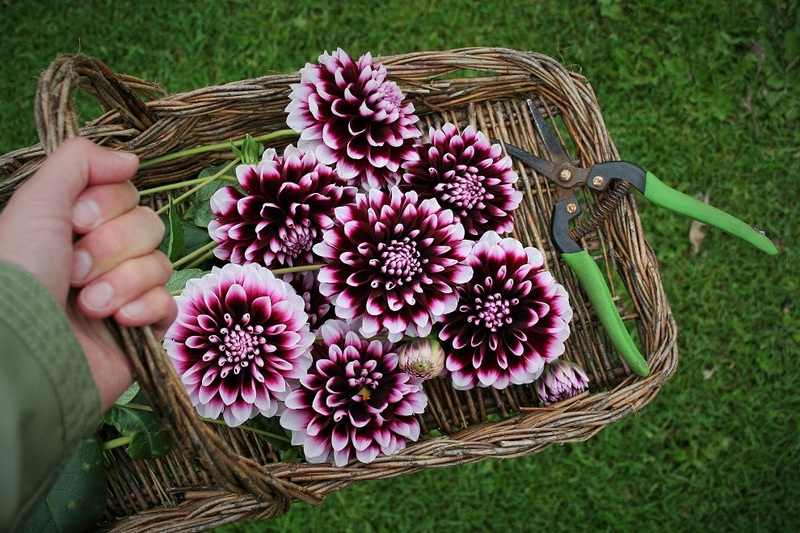 You can pick your own flowers, baskets and flower scissors are supplied for. They grow dahlias, Lathyrus, marigolds, cosmos. After you have created your own bouquet you pay for it according to the size. 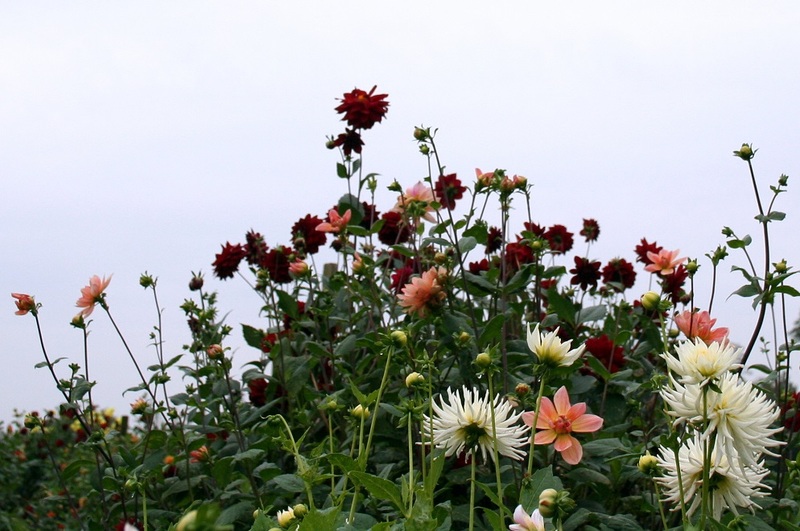 When we were there last September the dahlias were at their blooming peak and I immediately fell for them. The big bush like plants, taller than I am, towering over us with flowers as far as we could see. It was magical, I wanted that too! So I decided to join a Dahlia Association. 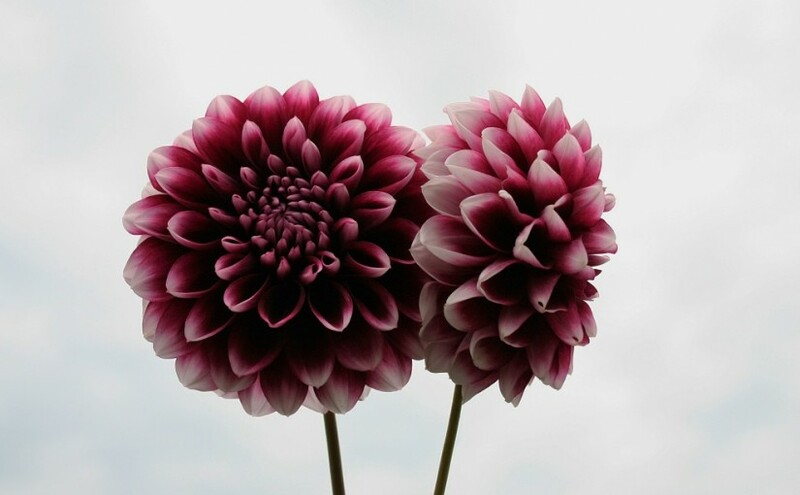 This association was established in 1954 with the sole purpose of growing dahlias. A few years ago the association changed several plots into vegetable gardens because of the demand for it. The allotment is close to our home, a 5-minute bicycle ride downhill. There are a clubhouse and a shed with tools: spades, rakes, wheelbarrows, everything is available. My plot is 20 m² and according to the chairman of the Dahlia Association, I will need about 40 tubers (I have learned something new already! 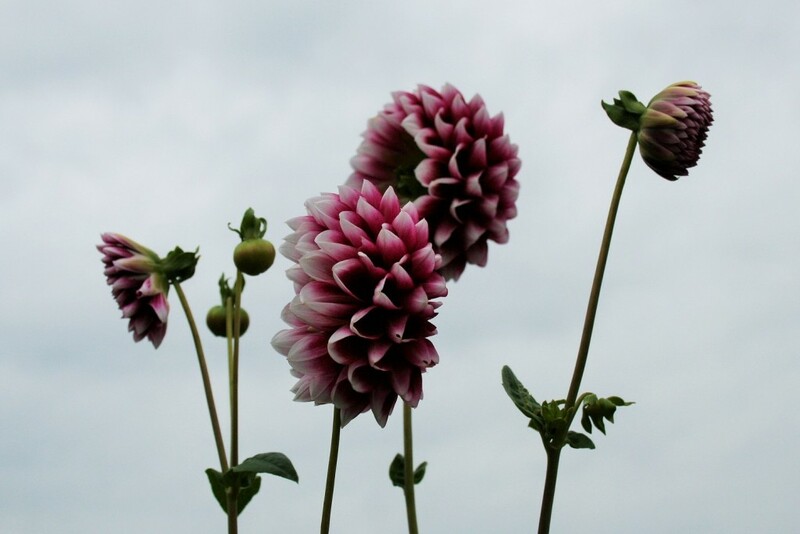 Dahlias are grown from tubers and not bulbs). I bought some at the market today. At the moment, some of the members are preparing the allotment for the new growing season. They have already spread chalk on the soil. The first thing I have to do is put manure on my plot. Planting starts in April. I can’t wait! Why you might ask, do I need an allotment when I have a garden at home that needs lots of attention? This is exactly what my husband asked me. I thought it would be a good idea to join up with experienced gardeners who actually know what they are doing. We will see how it turns out. 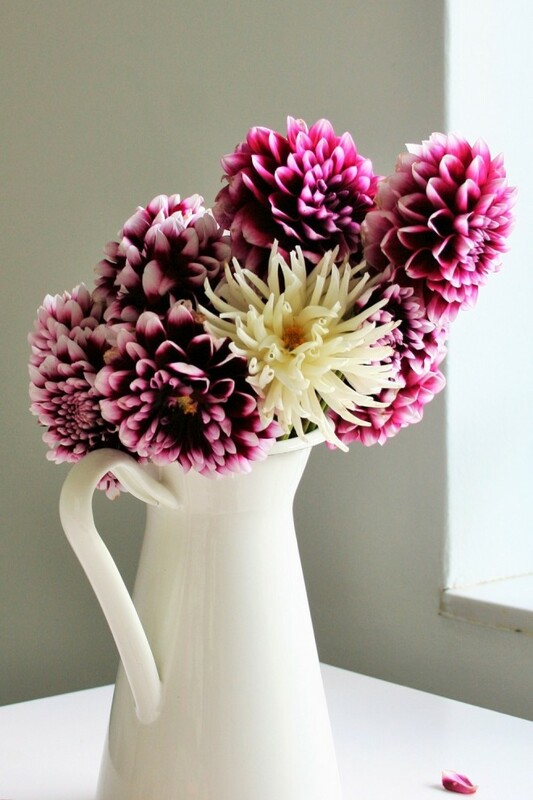 Dahlias were considered old fashioned but are definitely back. 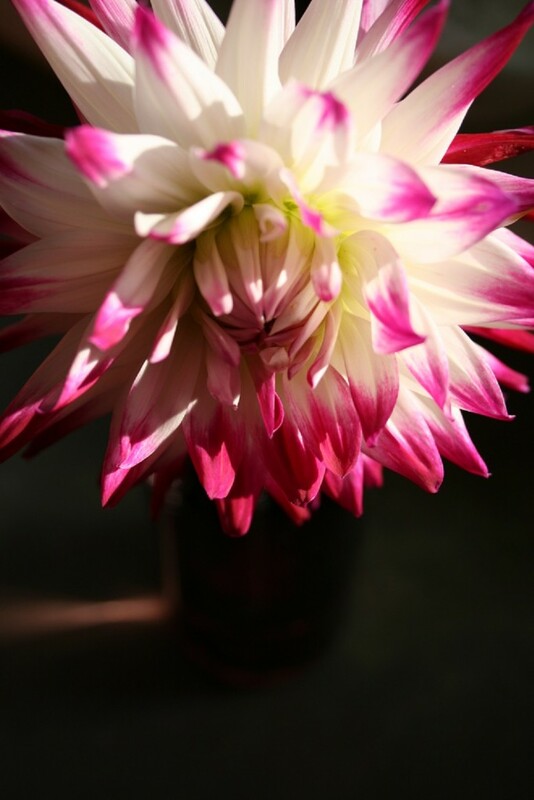 There is even talk of a dahlia rage, with the Café au Lait dahlia as the hottest dahlia of all. My florist friend Vanessa advised me to grow lots of Café au Laits. I will order them! What do you think, hot or not? Are you growing dahlias this year or will you be on my doorstep this summer, pleading me for a bucket full of homegrown dahlias? See you then! 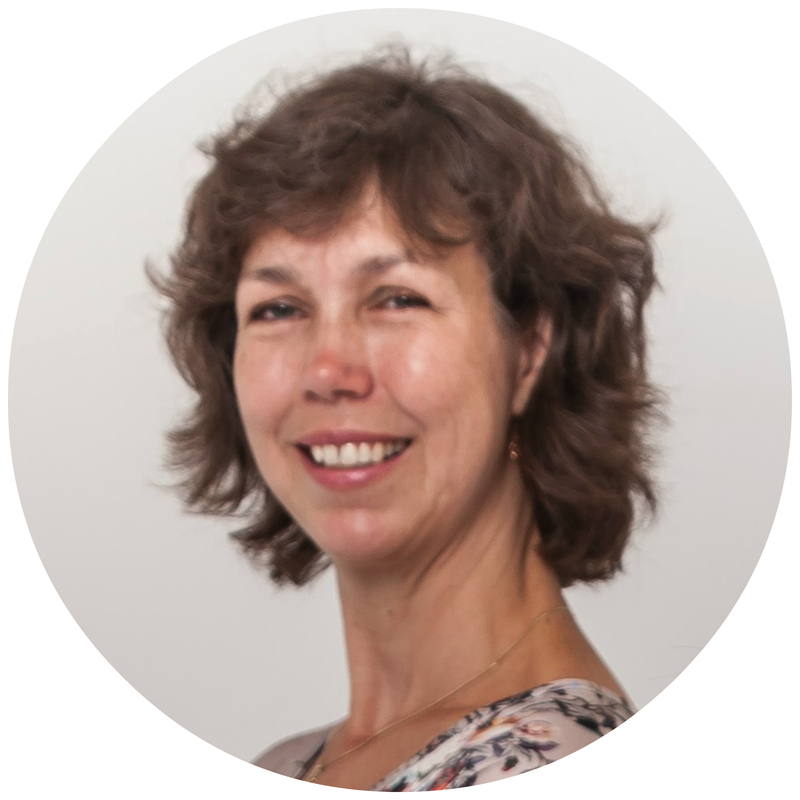 Pauline, oh my yes I read your post and totally enjoyed your quest for the dahlias beauty. 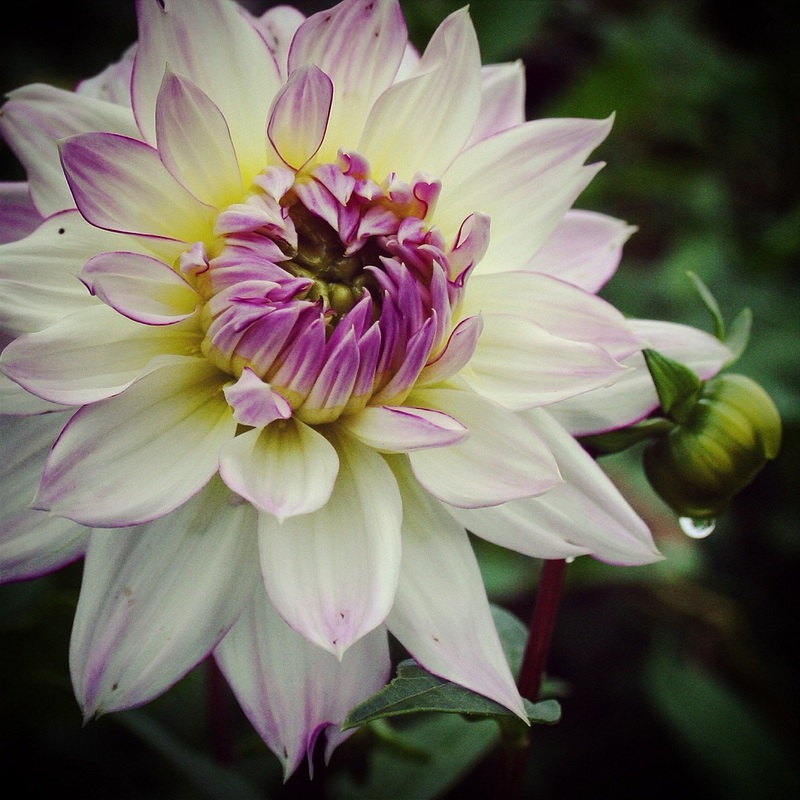 I’ve never personally grown this type of flower, but I will be after viewing your pictures of the Café au Lait dahlia. This is what I meant about stunning. I know you’ll completely enjoy your new allotment along with the other gardeners.. Perhaps, this is a great idea for me as well, it’s difficult to learn just from books, and I’ve always loved getting advise from actual people I can speak with.. Good Luck my dear ..
At our allotment there was this lady who had her whole garden planted with just dahlias. All pink. When I expressed my admiration for her flowers, she offered me some, she wanted to replace them because they were not the exact shade of pink. She taught me how to take care of them and showed me how to store them over winter. I never got to know her name, but I always called her Mrs. Dahlia. 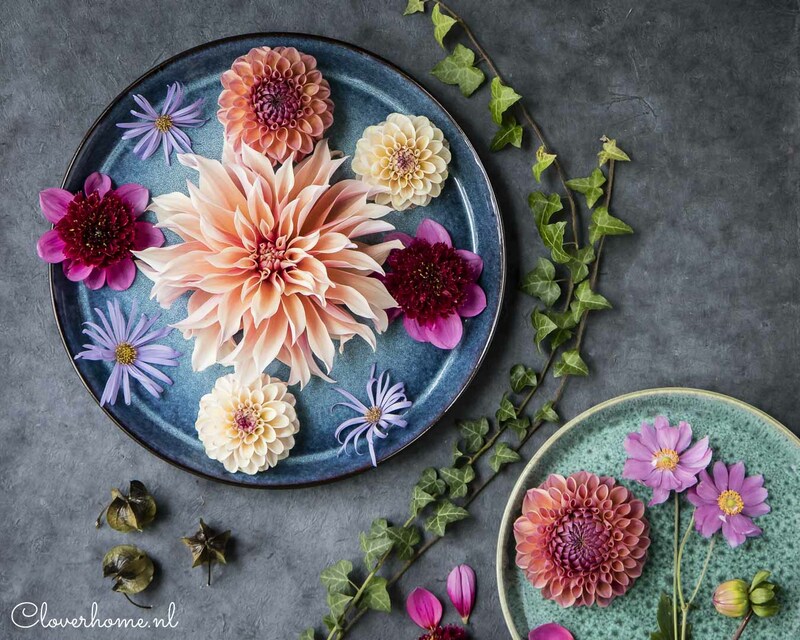 Wonderful story Anna, though it seems such a shame to grow just one dahlia when there are so many beautiful variaties. hot, hot, hot! Love them….